The 2009 General Assembly enacted S.L. 2009-350 (H 81) which amended the notice requirements set out in the open meetings laws. In general the amendments require public bodies that maintain webpages to post notice of regular, special and recessed meetings on those sites. In addition, the amendments clarify the requirements for posted and mailed notice of special meetings and for notice of emergency meetings. 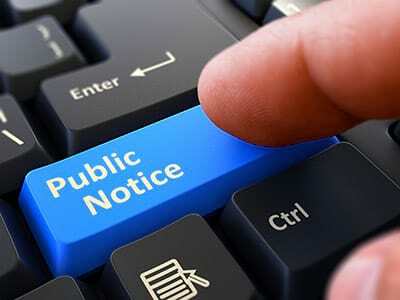 Public notice must also be given when land use planning is involved. For example, public notices must be given for public hearings involving Land Use, budgetary process, amendments to the Unified Development Ordinance and Town Ordinances. All meetings are held in the Town Hall Board Room at 95 East Main Street. All regular meetings begin at 6:00 p.m.
To change the text of the Unified Development Ordinance 152.052(D)(2), (E) (3) and 152.053 (H) (3) to create driveway construction standards on town-maintained streets and require permits. Parties in interest and citizens shall have an opportunity to be heard at said hearing. Information concerning the proposed amendment may be examined in the office of the Land Use Administrator, Town of Franklin, North Carolina at any time during regular business hours prior to the hearing. To change and modify the zoning classification as established by the zoning ordinance and the maps to which it refers by converting 1 parcel of land totaling 3.31 acres along West End DR, Pressley Rd and Old Murphy RD. The effect of the proposed change will be the rezoning of said properties from Commercial Secondary (C-2) and) to Residential (R-1) along West End DR, Pressley RD and Old Murphy RD. Parties in interest and citizens shall have an opportunity to be heard at said hearing. Information concerning the proposed amendment and a map of the property involved may be examined in the office of the Land Use Administrator, Town of Franklin, North Carolina at any time during regular business hours prior to the hearing. Matthew Breedlove will be serving as the Town of Franklin's new Fire Chief. Breedlove was chosen after the current Chief, Kevin Rohrer put in his resignation in order to pursue other opportunities back in his hometown. "I am blessed to have been involved in the Franklin Fire Franklin Department, providing a public safety service to the citizens in the Town of Franklin and surrounding Macon County Communities," said Chief Breedlove. "I am excited to lead the Franklin Fire Department in the future and continue to serve the citizens and visitors in the Town of Franklin and Macon County communities. I would like to say a big thank you to the Town staff who have shown support and care for me. I am excited and look forward to serving in the roll of Fire Chief." Breedlove currently serves as the Volunteer Assistant Chief at Franklin Fire and has a total of 17 years of experience in the fire service, most of which has been at Franklin Fire Department. He previously worked as a Narcotics Detective with the Macon County Sheriff's Department as well as a Patrol Officer for the Franklin Police Department. "I've known Matt for years and I am delighted that he was selected to be our new Fire Chief It was a strenuous selection process conducted by a committee of town staff, fire department members, and the current Fire Chief," Mayor Bob Scott said. Breedlove was one of many well qualified candidates to pursue the position. He will be stepping into the leadership role in a department of seven full-time staff, 10 part-time staff, and more than 25 volunteer firefighters. "We're very excited about working alongside Chief Breedlove moving forward," said Town Manager Summer Woodard. "The Town of Franklin feels confident in his abilities and in the Fire Department's ability to continue to provide the citizens of Franklin and surrounding areas with high quality emergency services."